Planning "Day at the Whiteboard"
SharePoint is a platform that can easily build custom solutions to meet specific business requirements. These are what is known as "no-code solutions" and composed of SharePoint artifacts (lists, forms, workflows) and so are known as Composites. Our team has extensive experience in designing, developing and deploying custom solutions to enterprise tier organizations. The end result is a team that understands the best way to develop a high-quality solution while maintaining the speed and agility necessary to get the product completed without surprises. 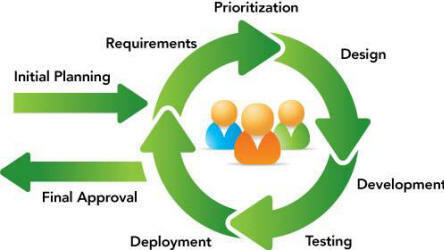 We typically use the Iterative Model employed by popular methodologies such as Agile and Scrum. We are passionate about providing exceptional client service that exceeds expectations and delivers top-notch solutions. Our commitment to professionalism, constant communication, and the utilization of industry best practices provides our clients with the assurance they need that their project will be successful. SimplePortals is a Microsoft Gold Certified Partner offering expert SharePoint consulting services. We offer SharePoint Migrations, SharePoint Installations, SharePoint Branding, SharePoint Deployment Planning Services, SharePoint Training, Search/Taxonomy Design, Governance Plans.